Relieves physical & emotional stress that can accompany pregnancy. 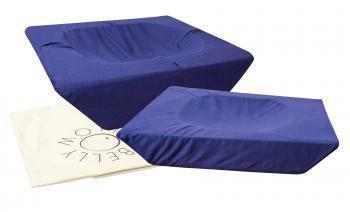 Specialy designed to decrease back & leg pains, legs cramps & sciatica, improve sleep and decrease levels of stress. but one of the most beneficial times for massage is during pregnancy. Our Pregnancy Massage sessions are designed specifically for pregnant women. Our therapists have specialised and advanced training. Our pregnancy oil blend will nurture and nourish your skin. After Birth Massage relieves back and shoulder pain which can be induced from holding your baby, breastfeeding and bad sleep. It even helps reduce post-natal depression*. And Baby Massage helps your child to reduce crying and sleep better. Most of the time by curing small problems such as wind, constipation, reflux and eczema. Belly Pillow® is the ultimate pregnancy pillow - the most efficient and effective way of examining and treating pregnant women. The Late Pregnancy Belly Pillow® makes it possible for a woman to lie on her front right through to the last few weeks of her pregnancy, making it easier for her to be treated at the time that she needs it most.